Day 4: There is nothing bland about these tofu cubes. You will actually want to eat them for their great, tangy flavour. They are great to add to fried rice, vegetables, even soups, but they work as a snack on their own too. It’s worth taking the time to press the excess water out of the tofu for a crunchier, tastier result. It’s a bit fiddly, but you could do a double batch and freeze half. (Just spread the cubes on a tray and place in the freezer until frozen, then put in a freezer bag.) For the marinade I just use soy sauce and chilli. Squeeze in some lemon juice for a sour note if you like. You can add garlic, but make sure it doesn’t go into the pan or it could burn. Adding turmeric at the end of the cooking gives an extra flavour note and a beautiful sunshine colour. To drain the tofu just place in a colander and place the colander in a bowl. Put a clean tea towel on top of the tofu and then put something heavy like a large bottle of water on top. Leave it for an hour. 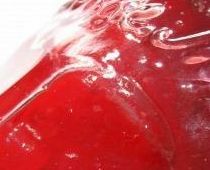 Pat dry and cut into slices with a sharp knife, then smallish cubes and gently pat dry again. Put the soy sauce and chilli in a bowl and stir in the tofu. Leave for at least half an hour, then drain. 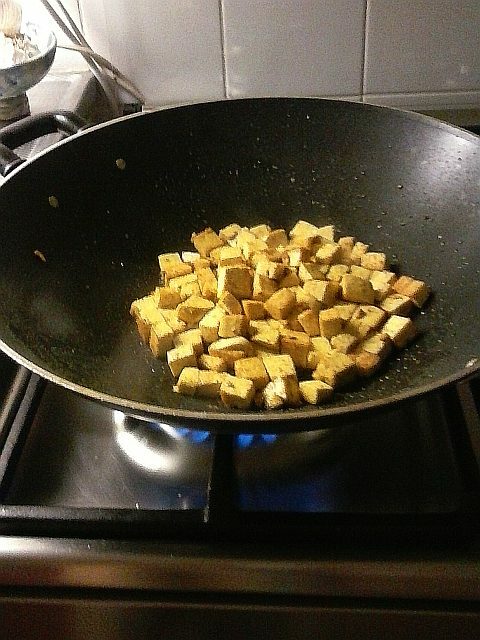 Heat a wok or large frying pan, put in the oil and when it is really hot add the tofu. Turn down the heat a little and fry, stirring carefully from time to time with a large spoon, until crisp and brown on the outside, warm on the inside. Just before they are done, add the turmeric and fry for a further minute. Drain on paper towels. Stir into the dish of your choosing or serve as they are. The sooner you eat them, the crisper they will be.